My project is Mysterious Bacteria vs. Evil Tobacco, the effects of tobacco products on bacteria in the mouth. 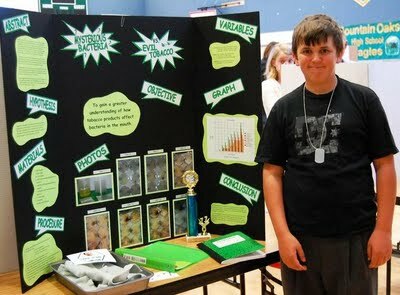 I was the only one to represent my school at the county level and to my surprise I got first place and my project was chosen to go to the State Science Fair in L.A. on May 2nd and 3rd. My problem is the cost will be around $500 and with the county's current budget they will not be able to help me and I really don't want to put any more strain on the county or my family. I am attempting to raise the funds to go on my own by trying to get donations. On Friday April 22 and Saturday April 23, I was outside of the Payless IGA Market in Copper displaying my project and attempting to raise funds to go. I did receive donations, but am still short. Donations may be mailed to my home. I would appreciate any donations even the smallest will help. My goal is to proudly represent Copperopolis and Calaveras County and hopefully place at the state level. A note from his Grandmother: "I believe that he is still about $300 or so short. They will be driving and with the way gas prices are going it is going to be hard to tell for sure. Then the fair is 2 days so they will have to stay nights and I am not really sure what rooms cost in LA. Whatever he can raise will certainly help, I was going to ask my boss if I could cash in some of my eto time if he doesn't get enough but I know they really don't like to do that except in an emergency. I really really appreciate your help." You can contact his Grandmother, Cindi Bent at cbent@caltel.com. Tickets are Available for the 46th Annual Sonora AAUW Home Tour! Send us Your Christmas Pictures! Merry Christmas From the Fichtners! Another Cute Funny From the Eddy's! Happy Tuesday Viewers.....I Know, I Know.... it's a Little Late! Last Day to Submit Your Photo's for Our Snow Contest! Next Upscale Resale Is Hiring! Help! Karen is retiring....NEXT needs You!!! Scotts Yogurt Factory is Hiring! Susan Cloud's Hair For You is Ready for You! Susan Cloud's Hair For You Has Added Services For You! Get Your Holiday Poinsettias From The Friends Of Angels Camp Library! Shop Food Buys & Beyond! EwePhoric Yarns 3rd Annual Memorial Day Deck Party This Weekend! Our Local Children Make Good! PineTreeKids Presents "Back To School Cupcakes"
Calaveras Stands For Justice & Peace... Again. San Andreas Victorian Christmas to Remember! Welcome to the "Recipe Box".....Sharing of Recipes With Friends! Susan Cloud's Hair For You Has Relocated & the Remodel is Done! Yin Yang Medical Spa June Special...Buy 2 Latisse Get 1 Free! This Week on Chef Chat....James Talks "Southwest Brined Chicken"
The Doobie Brothers & An Upgraded Ironstone Amphitheater Rocked Murphys! The Election Field For June Is Set.